VARTA® Powersports Gel batteries are specifically developed for the harshest conditions and most rugged terrain. Featuring our unique leakproof gel technology, this maintenance-free product is great for all-terrain and utility terrain vehicles. And it’s perfectly suited to touring bikes with plenty of extra performance features, such as anti-lock brakes. 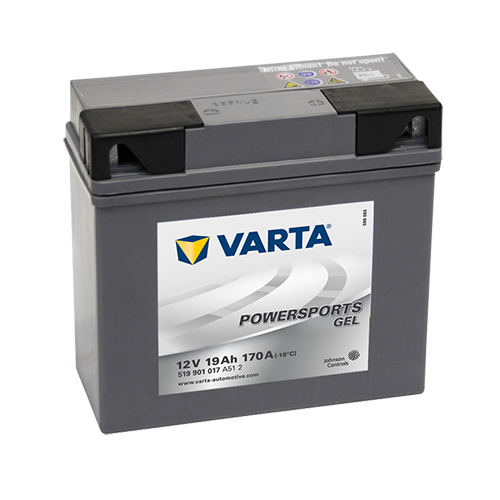 Why VARTA® Powersports Gel Batteries? Powered by Johnson Controls Power Solutions, VARTA® Powersports Gel batteries are trusted by customers globally. VARTA® Powersports Gel batteries provide longer life, less corrosion and lower cost of ownership. Take your vehicle to a workshop which works with VARTA® in order to experience excellent replacement service.